If you’ve been following along on Instagram, you got some sneak peeks of Ivan’s completed office on the day that we shot it. And if you’re anything like me, you’ve been waiting with baited breath to see those final pro images of the project! I’ve finally got the photos back and have to say, they’re everything I hoped they’d be and more. But before I do a full reveal of the whole shebang, I’m excited to share a few glimpses with you here today—especially because they highlight one of my favorite details in the space, the window treatment! The linen Roman shade that I selected from Blinds.com is such a subtle finishing touch. Yet I can’t imagine the room without it! Last month when I was detailing some of my inspiration for the office, I gave you guys a look at the process of choosing the fabric for our linen Roman shade. You might recall how I agonized which material to choose from amongst the many strong contenders amongst the swatches I ordered from Blinds.com. In the end I went with a 100% linen called ‘Alabaster’ in the Blinds.com Somerset fabric collection. 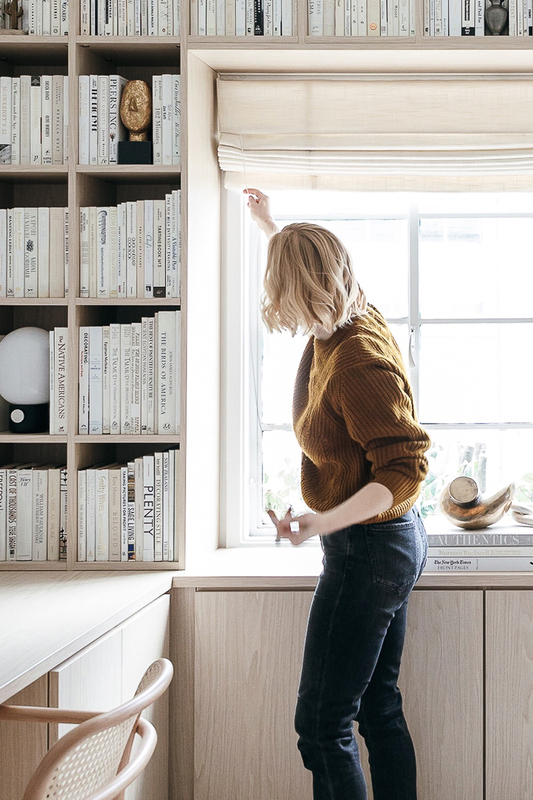 I chose it for its warm oatmeal hue and crosshatch weave pattern, which I knew would perfectly complement the wood grain of our build-in shelves. The completed shade shipped directly from the Blinds.com fabrication facility and the moment I slid it from the box, I knew I’d made the right choice! It creates the exact streamlined, monochromatic look that I was going for. A crisp box valance adds structure at the top, and twin vertical seams break up the expanse of material to add interest while still maintaining the modern look of the flat fold construction we selected. Ivan likes to joke that I sacrifice function in favor of style when making design decisions for our house—and it’s true that sometimes I do. But in the case of the Roman shade for the office, his function-first brain is just as satisfied as my fashion-driven one! We elected for fully adjustable manual pulls that allow me to tweak and fine tune the drop and proportion of the shade’s folds. (A design perfectionist’s dream!) As well, we both love the top down/bottom up lift option we chose for the Roman shade. Because this window looks out directly into our neighbor’s yard, we really appreciate being able to control the light entering the office while also maintaining some privacy. Ivan especially likes this feature, since he keeps his clothes in the office closet and often gets dressed in here! Ultimately, though, the main source of satisfaction for this window treatment comes from how incredibly easy the Blinds.com process was. As someone who deals with design installs all day, every day, I have huge gratitude for any vendor that can make my life simple. 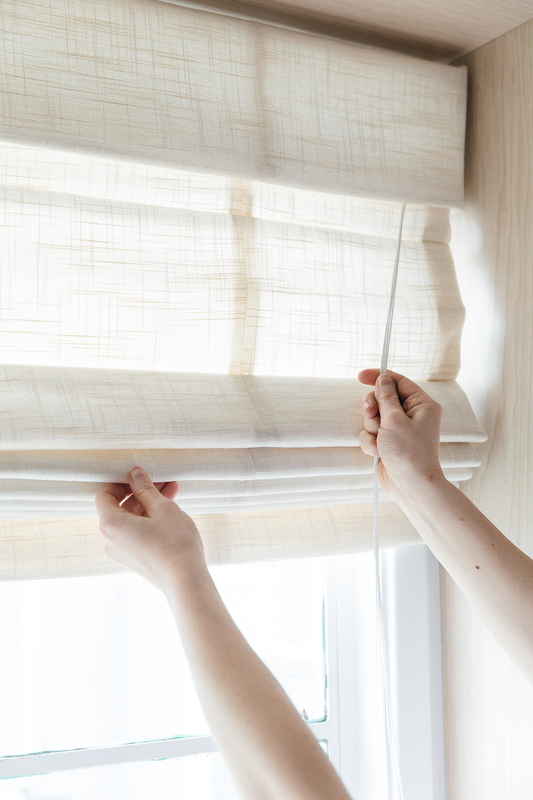 Window treatments in particular can be overwhelming, but Blinds.com connected me with Danielle, an on-call consultant to answer any questions I had. Danielle became my personal window treatments guru! She was available both by phone and email, always got back to me immediately, and walked me through my decision-making process when it was time to place the order. It was so nice to have full confidence that what arrived to my home for the install would be exactly what I’d envisioned! Speaking of the install, because Blinds.com offers professional measure and install services, I didn’t have to worry that my inexperience would result in any DIY errors. I could schedule the measure and install online, the pro was always on time, and the workmanship impeccable. Oh, and this all came at a price that was a fraction of the cost I’ve paid for other window treatment brands. I had such a great experience, in fact, that I’m already using Blinds.com for two clients’ homes. I really can’t sing their praises loudly enough! And as you’ll see when I reveal the entire space soon, this linen Roman shade truly is the crowning touch! Photos: Monica Wang. Disclosure: I partnered with Blinds.com to concept, style, produce, write, and share this post. All opinions are and always will be my own. Thank you for supporting the brands that enable me to bring you fresh inspiration daily!